SUSPENSIONS: The S version suspensions of the Multistrada 1260 are of the semi-active type and are controlled by the Ducati Skyhook Suspension (DSS) Evolution system. 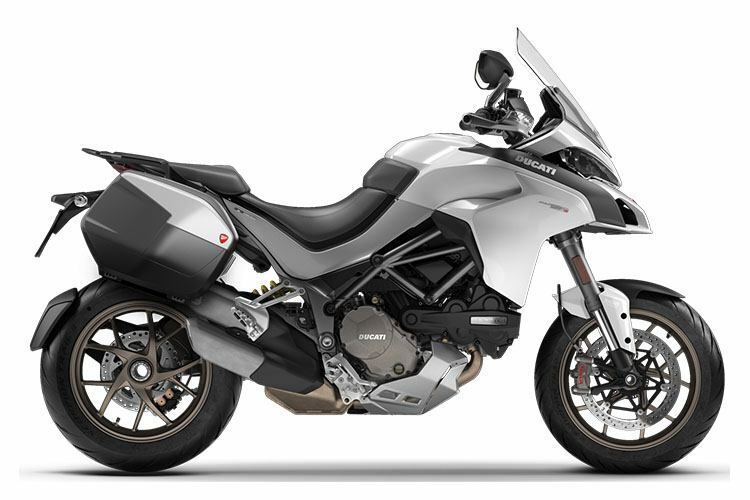 The Multistrada 1260 features a Kayaba 1.89 in. (48 mm) upside-down front fork with dedicated cast leg, with fully adjustable features (spring preload, hydraulic brake in compression and rebound, all on both forks). At the rear a Sachs shock absorber connects the swingarm to the left cast subframe: once again the features are adjustable - remote spring preload with hydraulic torque and hydraulic brakes in compression and rebound. The spring is progressive, resulting in increased riding comfort even when carrying the maximum load allowed. The S versions of the Multistrada 1260 are fitted with a 1.89 in. (48 mm) Sachs fork with the sleeves in the characteristic grey ceramic that identifies semi-active suspensions and forged legs. The rear shock absorber is manufactured by Sachs. Both the suspensions are of the semi-active type and are controlled by the Ducati Skyhook Suspension (DSS) Evolution system. In addition to adjusting the compression and rebound damping adjustment and rear spring preloading, automatic and integrated in the Riding Mode or customisable via the on-board computer, the semi-active system continuously monitors these elements to ensure the perfect balance of the vehicle. Both suspensions allow a 6.7 in. (170 mm) front and rear wheel travel, a value that guarantees absolute comfort when travelling even at higher load values, and extra safety when riding on soft off-road tracks. The sensation of pure comfort is further enhanced in the S versions by the DSS Evolution function that allows the rider to quickly and easily adjust the track alignment of the bike according to the various riding configurations and the type of trip: single rider, rider with panniers, rider with pillion rider and rider with pillion rider and panniers. The suspensions, on both the Multistrada 1260, and the Multistrada 1260 and D|Air have revised internal calibration. DUCATI SKYHOOK SUSPENSION (DSS) EVOLUTION: The Ducati Skyhook Suspension Evolution system has been tweaked even further, with forks and sensors.